The Shan chicken makhani masala spice mix is a formulated blend of only the finest herbs and spices that can be used to cook a dish described on the box as juicy chicken in rich tomato and butter sauce. Butter chicken is a dish that transcends cultural divides and is popular worldwide. 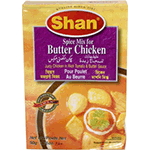 There are many different recipes for butter chicken mainly due to regional variations. You can use your preferred recipe or follow the one given on the Shan chicken makhani masala mix box to prepare a delicious meal with a mouth watering scent. The Shan chicken makhani masala mix makes it easy to cook this tasty dish as you do not have to measure out the right amount of each spice to balance the taste and get the right flavor. Product of Pakistan. Ingredients: Salt, Red chilli, Cumin, Black pepper, Turmeric, Garlic, Cinnamon, Nutmeg, Bay leaves, Ginger, Fenugreek leaves, Aniseed, Fenugreek seeds, Mace, Citric acid.